There are two approaches to Black Friday, the day after Thanksgiving that got its name from the notion that holiday shopping will help push retailers into the black. You can get up at zero-dark-thirty and drive yourself to the nearest big-box store where you'll wind up jostling with the rest of humanity for whatever items your fellow early birds haven't already picked clean. Or you could do what I do—roll out of the rack at a decent hour, pour yourself a cup of coffee, open your e-mail client to find a message from Apple about its one-day online sale, and follow the helpful links to savings galore. Mine is the optimal path, I think. 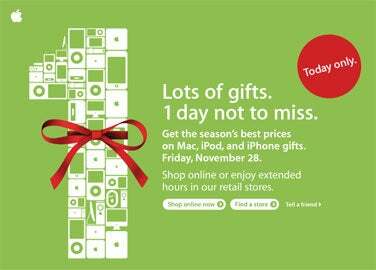 There are some modest savings on Apple hardware, to be sure: $51 off a 20-inch iMac, $11 off an 8GB iPod nano, $21 off a 160GB Apple TV. Some of the more popular Macs have some more impressive markdowns: Apple has knocked $101 off the prices of a 2GHz unibody MacBook. In addition to its own merchandise, Apple is also selling third-party products at discounts ranging from modest ($11 off Call of Duty 4) to eye-popping ($352 off the Special Media Edition of Microsoft Office 2008). If you're mulling the gift of Mac hardware or software for the rapidly approaching holidays, Apple's online sale is certainly worth a look-see. As mentioned above, this is a one-day event. So I will not be the least bit offended if you were to stop reading this post and get to clicking over at the Apple Store.